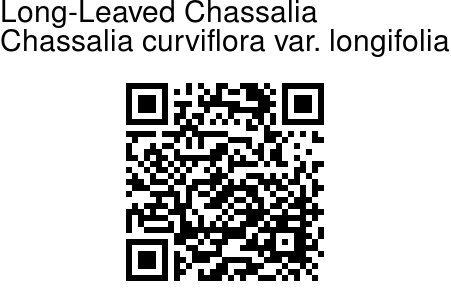 Long-Leaved Chassalia is an unarmed shrubs, subshrubs, or small trees, unarmed. Raphides present. Leaves opposite or in whorls of 3, sometimes with domatia. They are linear or linear-lanceshaped, 10-30 cm long, 1.5-3.5 cm broad, tip long-pointed, hairless. Blades are at least 6 times as long as wide, with more than 10 pairs of lateral veins. Stipules are persistent. Inflorescence are borne at branch ends, thyrsiform to cymose, many flowered, stalkless to stalked, bracteate. 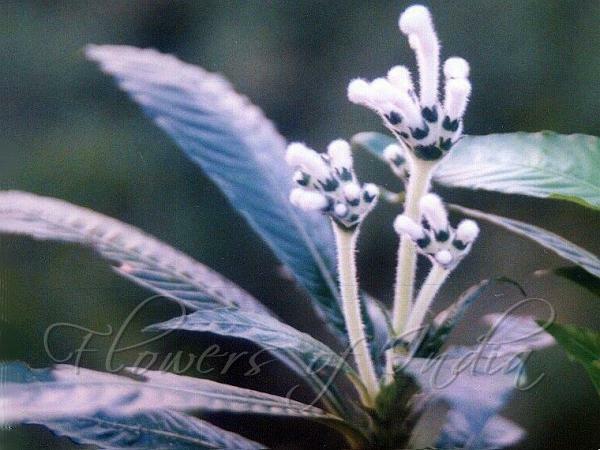 Flowers are stalkless or stalked, bisexual, usually distylous. Calyx limb is 5-lobed [to truncate or denticulate]. Flowers are white to pink or pale yellow, tubular to funnelform, with tube often curved, variously glabrous or pubescent inside. Petals are 5, swollen in bud. Stamens 5, inserted in corolla tube, included or protruding. Filaments are short or absent. Ovary is 2-celled, ovules 1 in each cell, basal; stigmas 2, linear, included or exserted. Infructescence frequently becoming purple with axes swollen and jointed. Fruit purple to black, drupaceous, fleshy, ellipsoid, subglobose, or ovoid, with calyx limb persistent; pyrenes 2, plano-convex, 1-celled, each with 1 seed, smooth on dorsal surface, on ventral surface with a large concave excavation; seeds medium-sized, compressed orbicular.